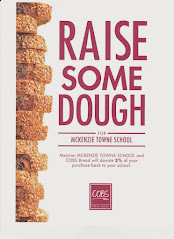 The new McKenzie Towne School is almost here! Serving K-4 children, enrollment for this new public school is already underway. Although the doors do no open until January, the school Principal, staff, and student population will be in place by August. The McKenzie Towne School Parent Association, a group of parents who share a common interest in enhancing our children's learning experience at the new McKenzie Towne school has also been established. As a new parent association, our current focus is to educate parents, recruit volunteers, and raise the funds needed for school programming, such as agendas, field trips, and a school playground. Given that this is a new school, we will have a lot of work to do in terms of organizing and fund raising. To do this, we need the help of as many parents as possible. Not only do we need input and fund raising ideas, we need parents to participate in the fundraisers themselves. How much, if any, funding will be in place for such things as agendas and field trips is currently unknown. We do know that there is no funding for a playground. It is estimated that the cost of a playground is between $150,000 and $200,000. It will be critical to start the fundraising process as quickly as possible if we want to have such things for our children. A parent association is not all about fundraising though. The association also has an important role in the decision making process about many school activities. Parent associations are often involved in decisions about field trips, special events, and school equipment. While our current focus needs to be on volunteers and fundraising, this is also a great opportunity to be involved in the decisions made at your child's school. The MTSPA will be holding an AGM in the coming months in order to elect an executive to carry out the business of the association. A website has been created at www.mtsparents.com , where parents can learn about upcoming meetings and fund raising initiatives. Parents can also contact the association through the website. This is an opportunity to get involved in your child's school. Whether you can give a lot or a little of your time and effort, your input is important to make our school the best it can be. Please contact us today at volunteer@mtsparents.com or 403-257-5524 with fundraising ideas and/or offers to help. Our next meeting is at 6:30pm on May 4th at the McKenzie Towne fire hall. All are welcome to attend.